Earlier this month HEXUS reported upon the departure of Chris Hook from AMD. He held the significant position of Senior Director, Global Product Marketing at AMD at the time. Furthermore, he had been a long serving ATI/AMD staffer – since 2001. Hook’s status post suggested he was having a break before moving on to company pastures new, but there was no hint that the company might be – Intel. 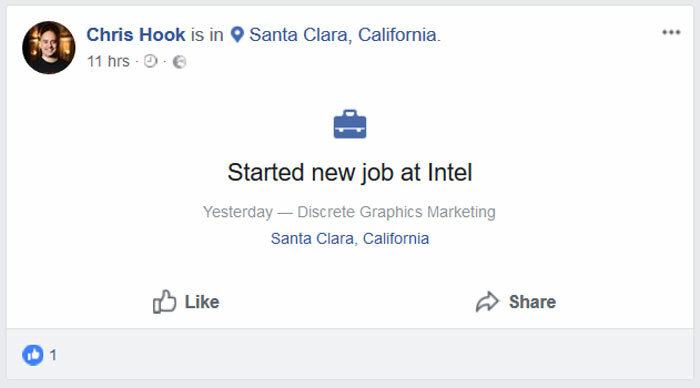 A few hours ago Mr Hook updated his Facebook page with a simple pre-formatted post saying he had “started new job at Intel”. A subheading described the position as being in “Discrete Graphics Marketing”, at Intel’s offices in Santa Clara, California. He will become the first ever discrete graphics marketing executive at Intel. (The post has got just one like at the time of writing - I checked, the like wasn’t from Lisa Su.) 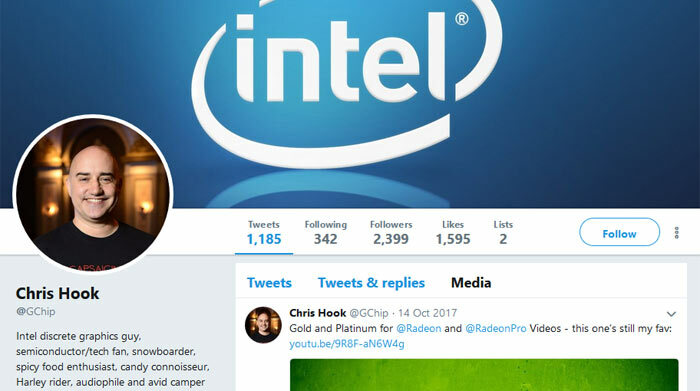 On Twitter, Chris Hook @GChip has also updated his profile to reflect his new position at Intel. Hook is just the latest high level AMD employee to be swiped by Intel in recent months. Raja Koduri similarly left AMD for a break before turning up at Intel. While not a direct swipe from AMD, veteran processor designer Jim Keller went to work at Intel last week, after two years working on AI self-driving processors for Tesla. It feels like an iceberg movement, and makes one wonder how many graphics engineers and execs from the lower ranks might have moved to Intel in recent months. To go through all the hardship at AMD and then leave just as all the hard work begins to pay off seems a bit weird. There has already been reports that Intel are working on their own Graphics card hardware. Is it just me who gets “page not found” from following the link in the article to his Facebook page?